This can be an area of huge debate and misunderstanding between employers and employees, but it does not have to be. The solution is to apply the basic principles logically and not over complicate the calculations. 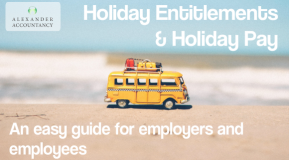 Holiday Entitlement – In the UK paid Statutory Holidays are 5.6 times the contracted working week in hours or days where it is specified and 5.6 times the average working week in hours or days where it is not specified. And this is inclusive of bank holidays which should be treated the same as any other time off. Using the out dated 4 weeks plus Bank Holidays principle over complicates the calculation and can create unfair discrepancies. Employers can also contract to additional holidays, usually for long service or as part of the package for senior staff. Calculating the paid Statutory Entitlement – For full time employees on a five day week the calculation is easy, it is simply 5 days x 5.6 which is 28 days per year. Or in hours on a 35 hour week it is 35 hours x 5.6 which is 196 hour per year. Where the hours are not contractually specified the entitlement uses 28 days but calculates the level of pay pro rata to the average amount of contractual payments in the previous twelve weeks worked. Why must Bank Holidays be ignored? – Imagine a situation where two employees both work three days each week with Employee A working Monday, Tuesday and Wednesday and Employee B working Wednesday, Thursday and Friday. You would expect them to have the same Statutory Holiday entitlement of 3 days x 5.6 which is 16.8 days per year and would normally be rounded up to 17 days. Now imagine we used 4 weeks plus Bank Holidays instead. In 2019 there will be four Bank Holidays on a Monday, then one Bank Holiday on each of Tuesday, Wednesday, Thursday and Friday. This means the holiday entitlement for Employee A would be four weeks plus six Bank Holidays, a total of eighteen days. Whereas the holiday entitlement for Employee B would only be four weeks plus three days, a total of fifteen days. Which is effectively a working week less and clearly unfair for someone working the same hours. Calculating the Holiday Pay due – Everyone that works as an employee is entitled to receive Holiday Pay regardless of if they are full-time, part-time or casual workers. For salaried workers and where hours and pay are fixed the calculations are straight forward. The rates paid simply remain the same as the salary or fixed remuneration. For both full-time and part-time shift workers with fixed hours the holiday pay is the average number of weekly fixed hours worked in the previous twelve weeks at the average hourly rate they received during that time. For casual workers where there are no fixed hours, a week’s holiday pay is the average pay a worker received for the last twelve weeks in which they were actually paid. Weeks they did not get paid are not included in the twelve weeks to be used. No more rolling up – Holiday pay has to be paid at the time the annual leave is taken. An employer is no longer allowed to include an amount for Holiday Pay in the hourly rate, known as “rolled-up holiday pay”. If any current contract still include rolled-up pay these need to be re-negotiated. What about additional earnings? – All of the latest rulings have agreed that additional contractual earnings should be included in the Holiday Pay calculation. This includes contractual, non-guaranteed and voluntary overtime; commissions and guaranteed bonuses. email info@alexander-accountancy.co.uk or telephone 01283 743851.